The introduction of online safety and privacy, and other aspects of cyber ethics, must begin at a young age so that children build lifelong habits for staying safe and secure. Savvy Cyber Kids provides children with the knowledge base to make better decisions through the use of traditional, age-appropriate educational materials that instill safety awareness well before children ever go online. 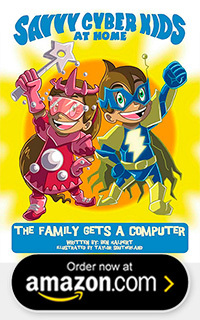 The Savvy Cyber Kids at Home book series rely on the element of play—with pictures, rhymes and the help of the Savvy Cyber Kids Super Heroes, Cyber Thunder (Tony) and Cyber Princess (Emma)—to deliver the message of online safety before children start playing in a virtual world. Just as young children are taught the rules of the road—look both ways before you cross—online safety rules are best delivered by parents and trusted teachers in the the home or classroom. Keeping pre-teens and teenagers safe on the internet starts before our children know what a keyboard is. Like most important life lessons, teaching online safety begins in early childhood. The Savvy Cyber Kids are just the right playmates for pre-school children and Emma and Tony speak their language. In The Savvy Cyber Kids at Home: The Family Gets A Computer, children learn to protect their personal information, like their name and physical location through their secret Savvy Cyber Kid identity. Through traditional early childhood teaching tools, this colorful book reinforces the message of online safety with pictures and rhyme. This playful tool and the Savvy Cyber Kids friends teach our children to keep their information private before they start playing in the virtual world. The adventures of CyberThunder (Tony) and CyberPrincess (Emma) continue in The Savvy Cyber Kids at Home: The Defeat of the Cyber Bully! While playing an online game, CyberPrincess and CyberThunder encounter a cyber bully. 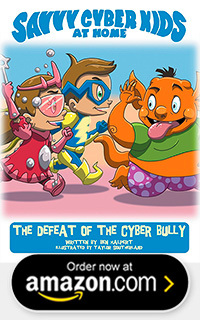 Throughout the book, Tony and Emma learn strategies on how to appropriately respond to a bully online. Like most important life lessons, teaching online safety begins in early childhood. The Savvy Cyber Kids are just the right playmates for preschool children and Emma and Tony speak their language. Through traditional early childhood teaching tools, this colorful book reinforces the message of online safety with pictures and rhyme. This playful tool and the Savvy Cyber Kids friends teach our children how to appropriately respond to a cyber bully before they start playing in the virtual world. All too often we see infants, toddlers, and young children unable to pull themselves away from technology. Whether at a restaurant, a park, the beach, the pool, or at a play date, young children today are mesmerized by the glowing screen of the latest connected technological gadget. If you have growing concerns about increasingly competing with technology to gain your child’s attention, have no fear. The Savvy Cyber Kids are here! 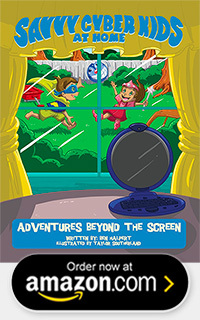 In the third installment of The Savvy Cyber Kids at Home book series, CyberThunder (Tony) and CyberPrincess (Emma) learn the benefits of thirty minutes of screen time. Once their thirty minutes of screen time are up and after brainstorming alternative indoor and outdoor activities, Tony and Emma discover other meaningful ways to have fun. With colorful illustrations, this charming story shares the value of enjoying life beyond the glowing screen. 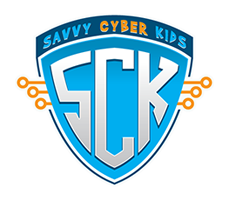 The Savvy Cyber Kids help parents and educators teach children of the twenty-first century to embrace a lifestyle that encourages exposure to technology in moderation. La prévention des dangers du Web pour les adolescents et préadolescents commence avant même que nos enfants ne sachent se servir d’un clavier. Comme la plupart des apprentissages importants, la sécurité sur Internet doit être abordée dès la petite enfance. Emma et Tony s’expriment avec des mots simples, ainsi les Cyberfutés constituent des compagnons de jeu idéaux pour les tout-petits. Dans Les Cyberfutés à la maison : le nouvel ordinateur, les enfants apprennent à protéger leurs informations personnelles telles que leurs nom et adresse en les dissimulant derrière une identité cyberfutée secrète. 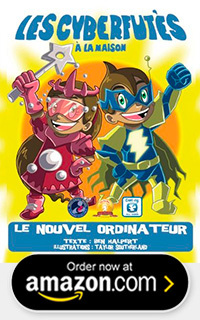 Utilisant les outils pédagogiques traditionnels de la petite enfance, ce livre original renforce son message de mise en garde à travers la présence de rimes et d’illustrations. Grâce à cet instrument ludique et en compagnie de leurs amis cyberfutés, nos enfants apprennent à garder leurs coordonnées confidentielles avant même de commencer à jouer dans le monde virtuel. Sicheres Umgehen mit dem Internet beginnt für Kinder bereits bevor sie überhaupt wissen, was eine Tastatur ist. Wie die meisten wichtigen Dinge, die man fürs Leben braucht, beginnt das Lernen von Sicherheit online in der frühen Kindheit. Cyber Kids mit Köpfchen sind genau die richtigen Spielgefährten für Kinder im Vorschulalter und Tony und Emma sprechen ihre Sprache. In Cyber Kids mit Köpfchen Zuhause: Der neue Computer lernen Kinder, dass man Informationen über die eigene Person wie Namen und Adresse schützen kann, indem man eine geheime Cyber Kid Identität kreiert. Mit traditioneller und auf Vorschulkinder zugeschnittener Didaktik betont dieses farbenfrohe Buch mit Reim und Bild, wie wichtig persönliche Sicherheit im Internet ist. 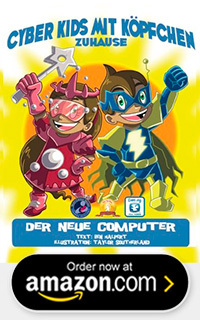 Die Cyber Kid Freunde bringen unseren Kindern schon vor ihrem Erkunden der virtuellen Welt auf spielerische Art bei, dass sie Informationen über sich nicht mit anderen teilen sollen. Manteniendo preadolescentes y adolescentes seguros en el internet empieza antes de que nuestros niños sepan que es un tablero de computadora. Como la mayoría de las lecciones de vida importantes, enseñando seguridad en el internet empieza en la primera infancia. 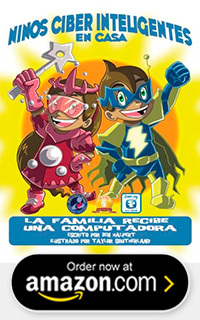 Los Niños Ciber Inteligentes son los amiguitos de juego apropiados para los niños de edad preescolar porque Emma y Tony hablan su idioma. En los Niños Ciber Inteligentes en Casa, La familia recibe una computadora, los niños aprenden a proteger su información personal, como sus nombres, su ubicación física a través de su identidad secreta de Niños Ciber Inteligentes. A través de herramientas tradicionales de educación, este colorido libro refuerza el mensaje de seguridad en el internet con fotos. Esta animada herramienta conjuntamente con Niños Ciber Inteligentes le enseña a nuestros niños a mantener su información privada antes de empezar a jugar en el mundo virtual.